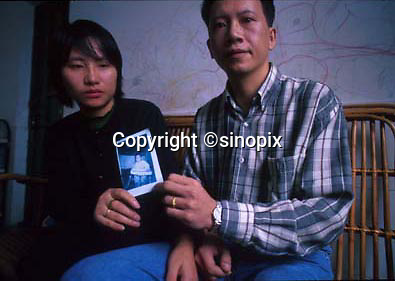 Au Ming Cheung (right) and his wife Yam Chau Chi hold a picture of their son Kam Chiu who was stolen from outside their home in shenzhen south China. China's One child policy and the whole nations craving for boys has resulted in a valuable trade in the highly prized young boys. As well as boys being stolen and sold into the coutry-side, the policy has resulted in a massive inbalance in the sexes with sometimes more than wtice as many boys as girls in some areas of China.